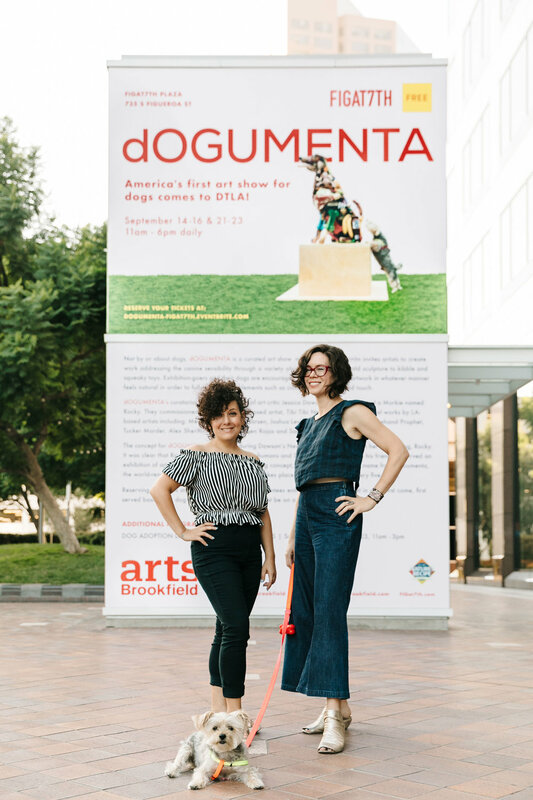 Record crowds flocked to DTLA for our September 2018 6-day exhibition featuring artworks by Meena Khalili, Janne Larsen, Joshua Levine, Gary Lockwood aka Freehand Profit, Tucker Marder, Tibi Tibi Neuspiel, Alex Sheriff, Ruben Rojas, Sabrina Clouden and Gali Basel. Click through the slideshow below for a tour with our curators. Rocky’s meta moment at the FIGat7th plaza in DTLA. Larsen’s social practice work incorporates paw prints collected from pups awaiting forever homes at the No Kill LA animal shelter as well prints from dogs who’ve already been adopted. 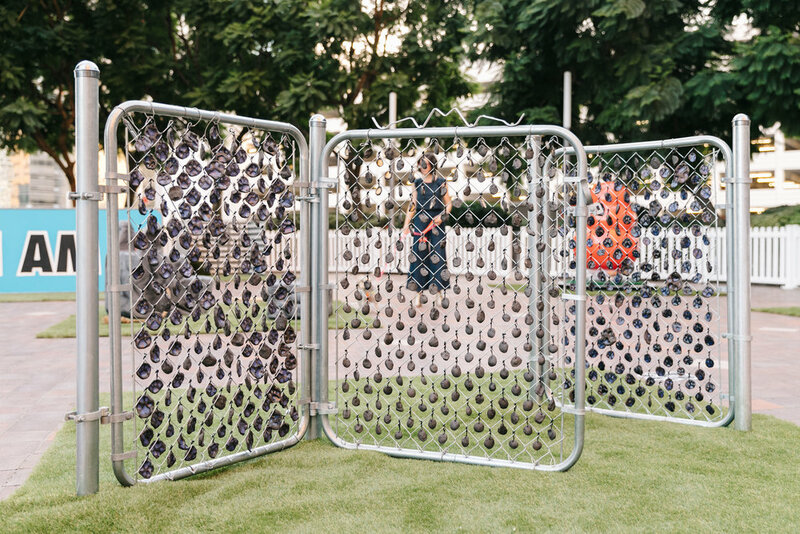 Ceramic paw prints hang on a gate that asks canine visitors to consider ideas of inclusion and exclusion in their communities. 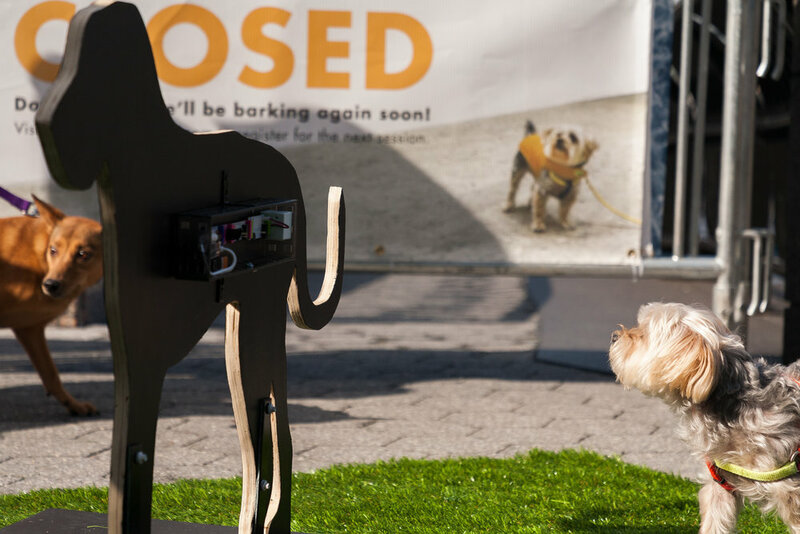 Lockwood’s interactive monument in three parts meditates on the history we share with dogs, referencing perspectives both personal and evolutionary. Three rune stones -- each carved with images of various breeds --- can be manipulated by exhibition-goers who are encouraged to push or pull on handles and ropes, an action that mirrors the push-pull of canine-human co-evolution across millennia. In this work that debuted at dOGUMENTA NY in 2017, Neuspiel offers a sculpture of the ideal, or ur dog. 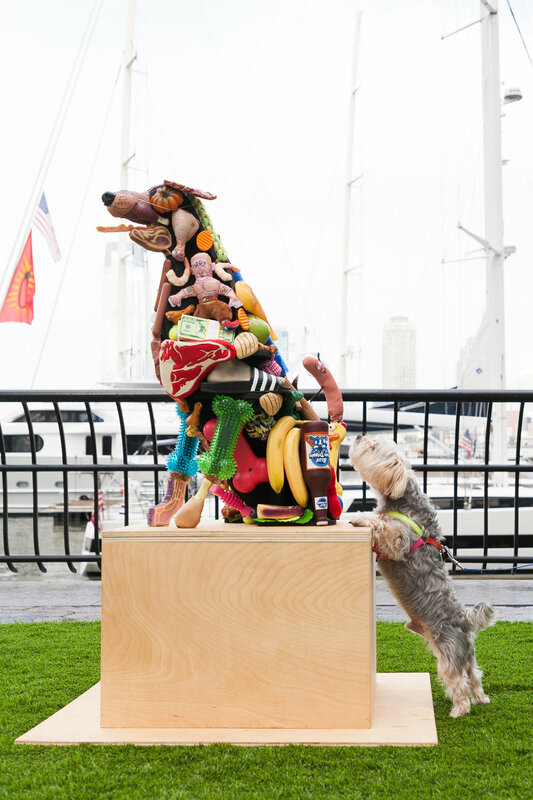 After consulting scientific studies describing the most appealing posture a dog can assume, the artist created a sculpture in that shape formed from cast and found dog toys and other objects. 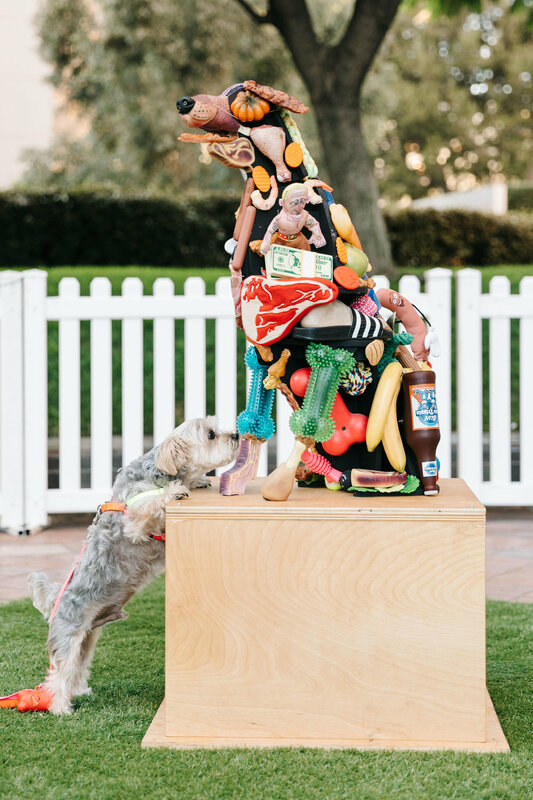 Referencing the history of inflatables in art – think Claes Oldenburg and Paul McCarthy – as well as the iconic Kong dog toy, Levine’s work asks canine visitors to confront a surreal, oversized version of a familiar form before reaching their reward: a cache of Nature’s Recipe kibble housed in the inflatable’s base. Marder’s work invites interspecies conversation via a totemic wooden pole fashioned by pigs living on an east coast farm. Shaped by rubbing and worn smooth by years of use, the pigs’ creation arrives in downtown LA redolent of swine scent and serves as a gesture of cross-continental, interspecies cultural exchange. The wiener crowning the pole winks at the hungers hog fragrance may evoke in 4-legged exhibition-goers. The creator of many renowned murals in Los Angeles and across the globe, Rojas adopts his signature form for a 4-legged audience in a two-sided, pup-sized wall mural. This other mural hints at some of the visiting pups’ deepest thoughts. Sheriff’s ziggurat-like form references ancient temple forms to celebrate the iconic friendship between humans and dogs and the progress of domestication over time. An accidental monument to human achievement even as it aims to aggrandize pups, the work offers an opportunity for our ever-loyal pups to forgive us our missteps and foibles. The piece includes Shawn Baltazor’s audio recording of Beethoven’s 9th symphony rendered in barks that can be enjoyed by pups who make it to the top of the pack. Fashioned as an elegant living room for dogs, Os imagines pups as collectors – of bones, naturally – and suggests that 4-legged patrons might be just as inclined toward accumulating and living with art as their human companions. In honor of dOGUMENTA LA sponsor Nature’s Recipe, Khalili imagines a fantasy road trip where pups can take the lead. 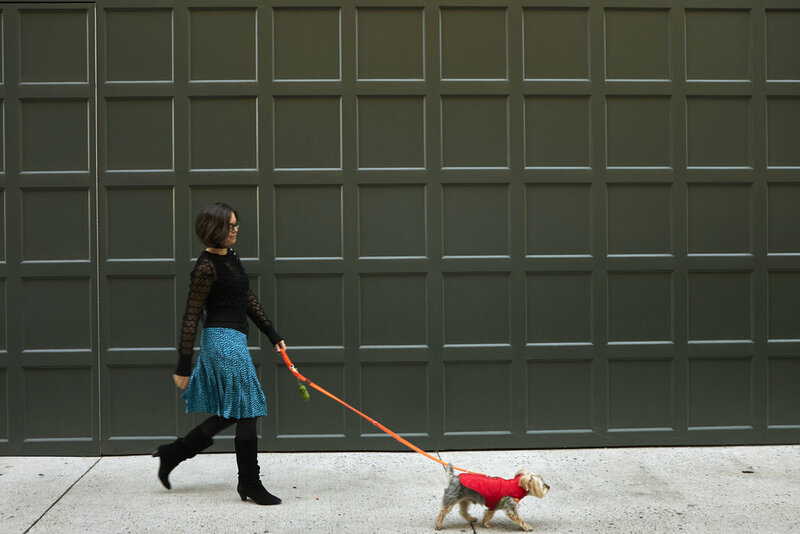 Her design is inspired by adventures with her own furry BFF, Cash. Our first exhibition, held over 3 days in NYC in August 2017, featured new artworks for dogs by Eleanna Anagnos, Graham Caldwell, Kathryn Cornelius, Merav Ezer, Eric Hibit, Margarita Korol, Tibi Tibi Neuspiel, Noah Scalin, Dana Sherwood, Paul Vinet. Click through the slideshow below for a tour with canine curator Rocky! After consulting scientific studies describing the most appealing posture a dog can assume, artist Tibi Tibi Neuspiel made this sculpture from cast and found dog toys. Eric Hibit’s dynamic abstract sculpture features a polychromatic color palette familiar to his canine audience: blues and yellows are emphasized. Dana Sherwood offers elaborate dog food sculptures resembling Victorian-era tiered confectionery. 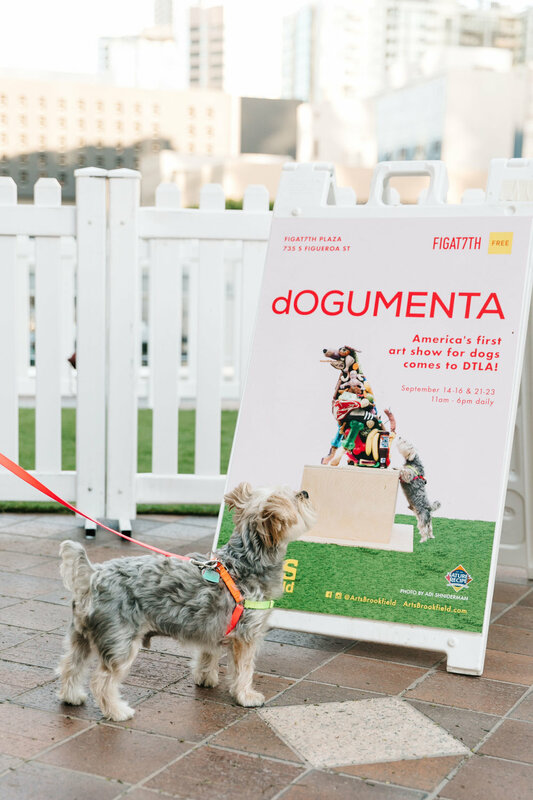 The work addresses issues of control between canine and owner--- will the owner allow the dog to eat the artwork, or not? Margarita Korol's work addresses an issue common in the canine community: anxiety. An audio recording of sweet nothings murmured by dog owners in several languages plays inside an abstracted human hug. Eleanna Anagnos explores phenomena outside our definable quotidian experience—the things we feel but we cannot explain. In this interactive piece, canines are welcome to walk on the moon-like surface as well as pop into the oasis pool to cool off. Merav Ezer condenses canine social engagement and communication to simple, elegant forms. Her AI “dogs” surprise and engage 4-legged exhibition goers with barks coming from familiar yet strange versions of themselves. Noah Scalin created a photograph of a portrait made entirely of dog treats depicting James Spratt, the 19th century inventor of the dog biscuit, inside a chapel-like doghouse. Within the space, dogs and humans are invited to contemplate their relationship as feeder and fed. 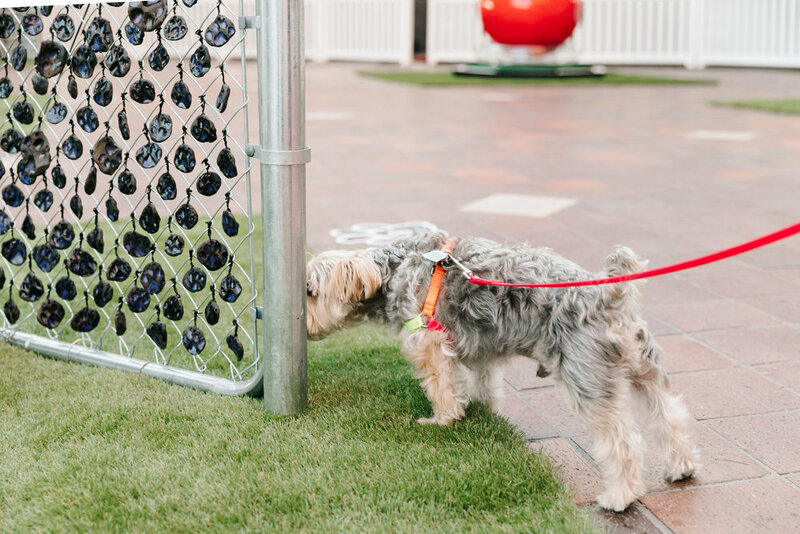 Paul Vinet offered a collaborative opportunity to canine visitors with his minimalist sculpture. Like Andy Warhol's Oxidation paintings, which the artist is said to have urinated, this work is also transformed by canine mark-making. Kathryn Cornelius' performance work addresses the energetic relationship of the pup and human by creating a space for intentional energetic connection through reiki, mantra, and guided meditation. Graham Caldwell provides an opportunity for dogs to interact with human furniture in a new and strange way -- and on their own terms. Sniffing out great art is more fun together. See what dOGUMENTA curators discovered when they visited Chelsea galleries. 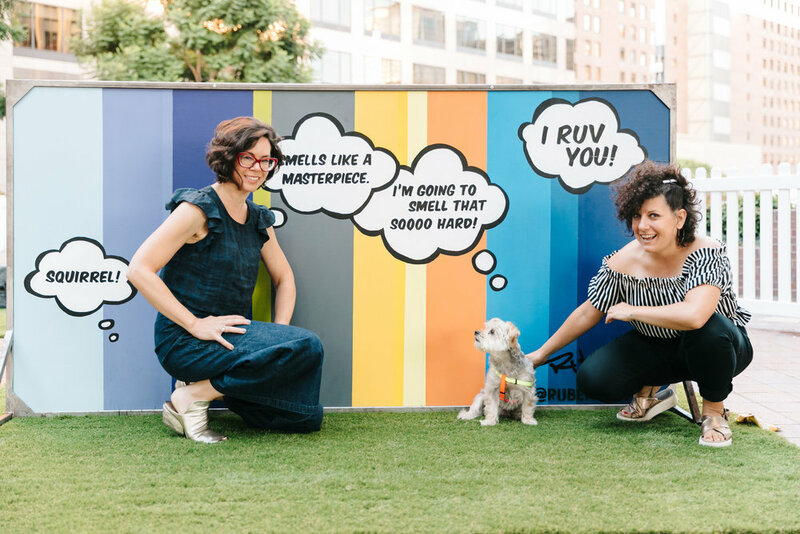 Sniffing out great art and culture is more fun together! Rocky trusts his instincts and lead the way to Mary Boone Gallery. Following your nose pays off! Rocky discovered Lost Objects by artist Allan McCollum at Mary Bone... er...Boone gallery. It includes 240 cast concrete replicas of bone fossils from the Carnegie Museum of Natural History. The color red is not visible to a dog's eyes, however this didn't stop Rocky from an interest in the surface and textures of this Elliott Hundley painting on view at Andrea Rosen Gallery. Getting absorbed in the textures of the Julian Schnauzer... Schnabel New Plate Paintings at Pace. Rocky has become a real Carl Andre aficionado. He loves when the work is on the floor or very low to the ground. This sculpture at Paula Cooper is the perfect height to engage Rocky's curiosity. Sometimes you need to change your perspective to really see the work. Both Rocky and Jessica got a good angle on photos by Yinka Shonibare MBE at James Cohan gallery. Some intriguing artworks can be quite challenging for a small canine. Rocky is disconcerted by the air inflated "breather" sculptures by Paul Chan at Greene Naftali Gallery, yet he bravely approaches them. At Gallerie Lelong where Rocky is intrigued by the oversized heads carved from salvaged wood by Jaume Plensa. Dogs have a very sophisticated way of perceiving human faces - it activates not only their visual processing but also the areas of their brains associated with communication, emotional expression and storing memories. The totemic forms and drawings of Pedro Reyes hung floor to ceiling at Lisson Gallery allowed everyone a fine view from their own perspective.